In my class of mostly undocumented students, we’ve been talking about hope. We’ve been talking about triumph over adversity. We’ve been talking about staying focused when fear, hate and uncertainty swirl around you. 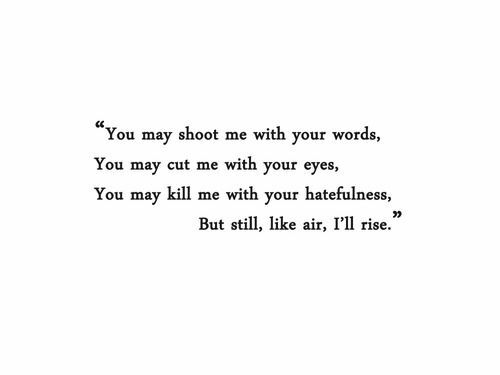 We have plunged head first into the pools of Maya Angelou’s fierce words of perseverance. Brave hearts speak volumes over fear. Loving hearts defy hate. These kids have both in spades. A world exists for them that does not for me. I’ve never had to move from place to place every few months, hoping to evade the gangs that want to end my life. I’ve never had to see my father gunned down off of his bicycle in the street. I’ve never had to watch my family starve through a destitute economy that has left no jobs to be found. My life has never been so at risk that I would risk it further for a chance to see my child survive. I’ve never had to crawl into a trunk, hoping for freedom, unsure if the trunk would ever open again. I’ve never had to walk for two days without food or water. I’ve never been left on the side of the road to die because I injured my foot and became a liability. I’ve never had a gun pointed at me on a train, forced to watch another be gang raped. I’ve never been so dehydrated that I’ve dropped to the ground to guzzle water filled with sewage. In my public school ESL classroom, teenagers fill the room with noise, hormones, and laughter. They talk too much, they forget their pencils, they get in trouble for playing with their soccer ball in class. They call me Miss, Seῆora, Maestra, and Mom. They shake my hand and hug me as they file into class. They are as thoughtful as they are chatty. They are as hardworking as they are forgetful. They are as emotional as they are dedicated to their education. They are typical teenagers, like any teenager in any classroom around the world. Sitting in their desks, bent over their composition notebooks, the stories that they harbor are not evident. Their stories come out in pieces, quietly over time. Even in sharing their stories, they are not defeated. They are matter of fact. They are hopeful. They are determined. The grace of God shines through their sense of humor. They often work after school and on the weekends, helping to support their families. They dream about going to college to become nurses or entrepreneurs. They are examples of focusing on love instead of hate. They are a constant reminder that God, not a man, is in control. I am thankful for these kids and their families. I am thankful for the ways in which they inform and stretch my world views. I am thankful for their young hearts that rise each and every day, never giving up their fight for safety and freedom.